Candy skulls are everywhere you look these days and they are becoming somewhat of a trend, so it’s not surprising that Thunderkick Games have capitalised on the theme. 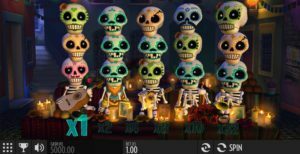 Esqueleto Explosivo literally means exploding skeletons, so let us at Boku Slots guide you around this great site. 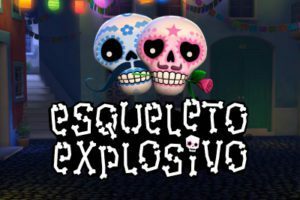 Esqueleto Explosivo is a 5-reel, 17 pay line slot game with an RTP of 97.6%, which is pretty high compared to other slot games. The bright and fun design has a hint of comedy to it, which is something many of us look for in an online game. Bet Amounts – Betting runs from 10p per spin up to £100 per spin, but these are the only adjustable variables within the game. To amend your bet amount, click on the casino chip icon and select the required bet amount from there. Wild Symbol – Your wild symbol is epitomised by a golden skull wearing shades. It substitutes for all other symbols and will explode taking out the surrounding 8 skulls and increasing the multiplier by one level. Other Symbols – Because the game offers a simple design, you only have 6 symbols in play. These are (in order) the Explosivo Golden Wild Skull, then your other skulls in the colours blue, green, peach, pink and yellow. The wild symbol does not have any pay out attached to it, however the other skulls do. The highest paying is the pink skull which will award 250x the bet amount, if 5 or more are landed on an active pay line. Dropping Symbols feature – This feature gives the game a little of what it can be lacking in the bonus department. Every time you make a winning combination those symbols involved will explode and new ones will drop down in their place. This in turn lays the path for new winning combinations to be created and as a result you will then experience the Mucho Multiplier as well. Mucho Multiplier – This is an interesting twist that triggers after every win, or when a wild explodes on the reels. The outcome of a win is that your multiplier will increase, so if you have a number of wins (dropping symbols and completing combinations), then the multiplier will increase by one level every time. We don’t know about you, but the Dios Del Muertos has never been more fun. Not only do the skull characters come alive on wins, playing their instruments and singing a little tune. But they are intriguing to watch as the game is in play. Whilst there are limited features and zero bonus games which can be activated, we don’t think this has a detrimental effect on the game itself. Overall we found it to be fun and enjoyable and don’t forget that awesome RTP of 97.6%, for a game that’s lacking in features it definitely makes it worthwhile.